At the moment it looks like this is the last event I’m presenting at in 2016, so let’s make it a good one. Hope to see you all there! I was initially planning to get a taxi from Sandanski to Sofia airport. Fortunately Sve and Mimi were driving back at the same time, so I got a lift with them, which was much better company. 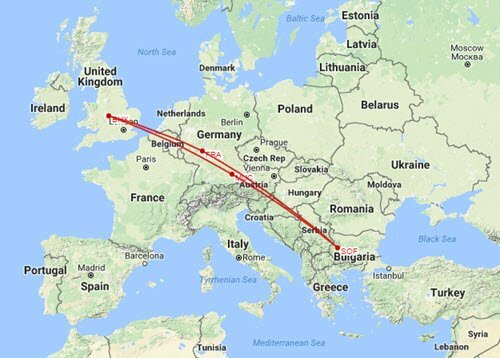 The flight from Sofia to Munich went as planned. After a 110 minute layover in Munich, it was time for the last leg of the journey to Birmingham. Once again, so drama there. So now I’m home and my 5th BGOUG conference is over. Once again, Melina and the BGOUG team did a great job. No offence to any other user group, but BGOUG is still my favourite conference of the year! Thanks to everyone at BGOUG for making this run so smoothly. Thanks to the Oracle ACE Program for letting me “fly the flag” for the program. Your support is much appreciated! Thanks to all the other speakers. Your advice and support is always welcome. Of course, thanks to all the attendees who came to my sessions and made me feel so welcome. I look forward to seeing you all again next year. I’ve shared a few photos on Google+. Day 2 started with a swim and breakfast. When I say swim, I really mean gentle floating, wishing I was still in bed. The first session I went to was Joel Goodman‘s session on “RAC Global Resource Management”. Lot’s of good stuff! Joel is like a walking Oracle encyclopedia. Next up was “Oracle 12c Automatic Data Optimization” by Joel Goodman. Nice feature. Once again, another thing added to my to-do list. I think the developers have done a really bad job of naming the views and some of the procedures for this feature. I would have abbreviated words and added underscores to stay under the object name size limit. The naming feels like “Peter and Jayne do programming”. Ugly, ugly, ugly! In terms of the feature itself, the main issue here is ILM doesn’t work with the multitenant option. I’m sure this will be fixed in future, but for now it is a big flaw. Even so, lots of potential here. After lunch it was “Utilizing new CBO features after upgrade to 12c – Practical example” by Joze Senegacnik. I have to admit, I turned up late for this one. Very sorry mate! The part of this session I saw focussed on a specific customer upgrade from 11g to 12c. I ducked out of the last session on the day and headed back to my room. During the day I had been asked a few questions I did not know the answer to, but I know other people who probably do, so I pinged out a few emails. In the evening we took a quick sightseeing trip to Melnik. We had a walk through the town and did a quick tour of a famous winery. From there is was back to the hotel to get some food, then bed. I’ve got an early start this morning to begin my trip home. I’ll write a summary post when I get back. The morning started out with a family swim with the wife and daughter. The first session I attended was “Auditing in Oracle Database” 12c by Maja Veselica. I haven’t spent any time looking at 12c auditing yet, so this was a great introduction. I think I’m going to need to spend some time on this stuff. It looks like there are quite a number of changes to auditing in Oracle 12c. Next up was “Do Oracle Cloud Applications stack up?” by the wife. You’ve gotta show some support or they just go on at you! This focussed on a customer story about how Fusion Apps on the Cloud was the correct choice. Many of the points raised were true of a variety of cloud solutions. Resistance is futile. We will all be water droplets in the cloud soon! The final session of the day was “Real-World DataGuard” by Yavor Ivanov. The introduction part of the talk covered familiar ground for me, but as the session progressed there were a number of thing mentioned that were new for me. I’ve put another note in my to-do list to spend some more time of data guard, especially in 12c. So I’m back in my room, writing up this blog post before the evening meal and dancing. I don’t have any presentations to give tomorrow, so I can relax and enjoy other people’s sessions. As always, a great first day at the BGOUG conference! The flight from Birmingham Airport to Frankfurt went to plan. The landing was quite possibly the smoothest one I had ever experienced. Very impressive. I got off the plane to find my connecting flight had been moved to another terminal. I was pretty worried by this as Frankfurt is a massive airport and I already had a short connection time. Luckily I made it. The flight to Sofia went without a hitch. On arrival, I met up briefly with some of the other speakers before we were whisked away to Sandanski. It was a 3 hour drive, but I was chatting with the wife all the way, so it went quickly. In the evening we met up with some of the other speakers and the BGOUG folks for dinner in a restaurant right next to the hotel. After that it was back to the room to get some much needed sleep. What with the 03:30 start, two flights, a 3 hour drive and a quick session in the pool I was completely knackered.